Image Size: 32 X 48 in. Fire trucks, fire trucks, fire trucks!!!! Collin loved fire trucks. 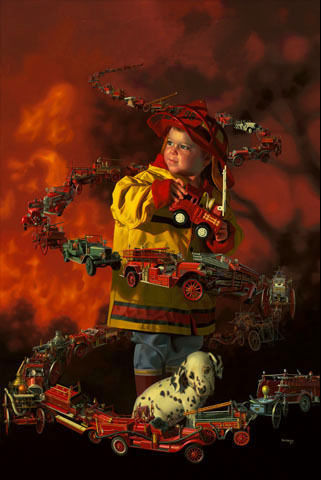 When he was three his Grandma and I took him to the Hall of Flame Firefighters Museum in Phoenix. He absolutely loved it and could talk about nothing else all night. Of course, on is birthday everyone in the family bought him some kind of fire truck and on Halloween Grandma bought him a fireman’s costume complete with helmet, boots, and a yellow coat. We took him to our neighborhood firehouse and the captain let him sit in the driver’s seat of the hook and ladder. I guess it shouldn’t have come as a surprise when, one evening about nine o’clock, while Collin was staying with us, that Collin himself received an urgent phone call. It was our district fire chief. “Collin”, he said, “we’re battling a four alarm fire up on Navaho Ridge”! We desperately need your help right now!” Collin grabbed his helmet, coat and boots and was out the door.